Scamble eggs; stir in cooked sausage and salsa. Warm tortillas in microwave 20 - 30 seconds or until warm and flexible. 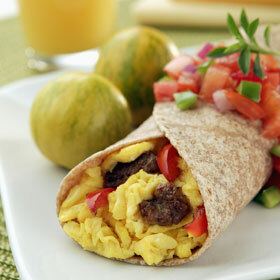 Place 1/2 cup egg mixture into tortilla; roll burrito-style. Freeze burritos in single layer on lightly greased cookie sheet. When fully frozen, wrap burritos individually; place wrapped burritos in large zip-top freezer bags; freeze. Makes 24 burritos. TO SERVE: Unwrap burritos from foil or plastic wrap that you used for freezing. Wrap in a paper towel. Cook in microwave until heated through (about 2 minutes). Or thaw burritos (remove plastic wrap if used in freezing), wrap burritos in foil, and bake at 350 degrees for ten minutes.